In a confirmation of the mounting troubles for NDTV’s promoters Prannoy and Radhika Roy, the media company has informed the Bombay Stock Exchange (BSE) of them receiving a show cause notice from the Income Tax department in March. 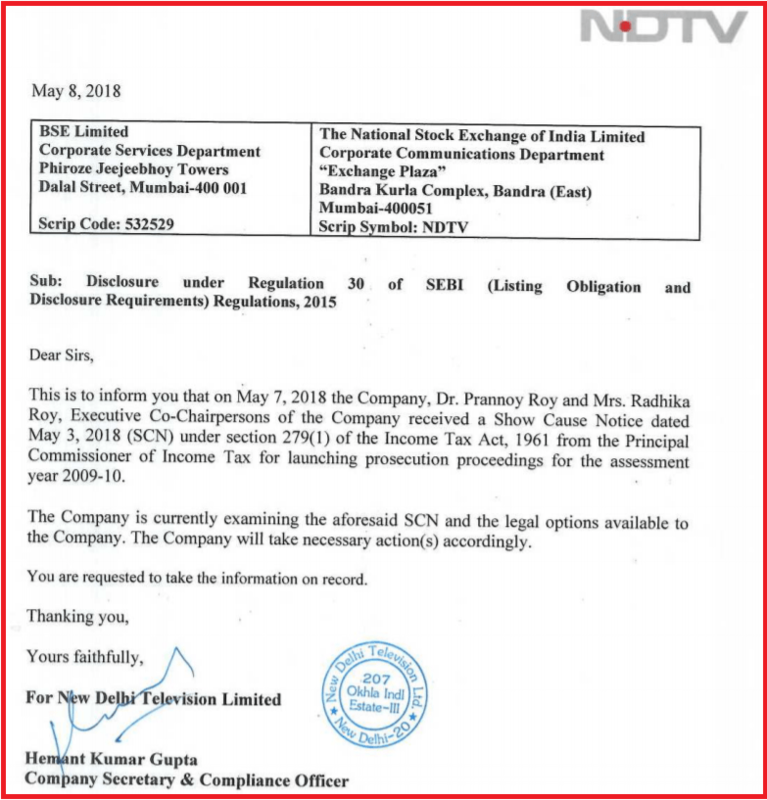 As per a press release issued by the BSE on 8 May, the aforementioned Executive Co-Chairpersons of NDTV had received a show cause notice from the Principal Commissioner of Income Tax dated 3 March 2018, with regards to the assessment year 2009-10. As seen above, the Company Secretary and Compliance Officer in a letter dated 8 March had informed the national stock exchange that the Roys’ had received a show cause notice on 7 March from the Income Tax department under section 279(1) of the Income Tax Act. NDTV claimed that as a result of that it was examining legal options available to the company with regards to the show cause notice. This case pertains to the IT Department levying a penalty of Rs. 436.80 crores for the assessment year 2009-10. The channel had later approached the Delhi High Court which had refused to intervene in the matter and in turn asked the channel to approach the Commissioner of Income Tax (Appeals). The Principal Commissioner of Income Tax had refused to stay the demand and instructed the channel to pay 30% of the penalty amount in a staggered manner by 15th June 2018. The said three instalments of this amount had to be paid on 15 April, 15 May and 15 June respectively. The news of such a letter to the BSE comes in the light of NDTV having to sell a stake in its subsidiary to its landlord, as a form of paying its outstanding rent. NDTV has reported horribly against Narendra Modi right since 2002. But among all stark lies spread by NDTV, one which needs to be immediately exposed is this.